I work with a lot of authors, both published veterans and newbies to the Indie scene. 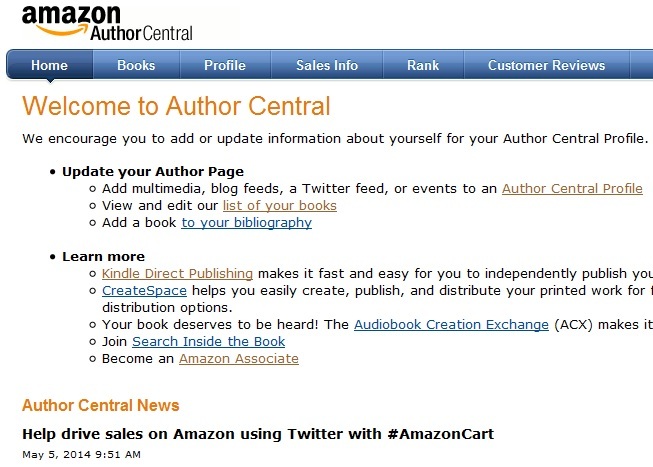 When gathering information about them, one of the first places I visit is their Amazon Author Central page, where writers can customize a personal profile and also get excellent data on book sales, author ranking and answers to support questions. Think of it as your Amazon social media page. Surprisingly, many authors haven’t created one, and this is true for newbies and veterans alike. In those cases, clicking on their name at the book’s product page simply leads to a search engine result showing a list of books that may have been written by that author or someone with the same name. It’s a wasted opportunity when an interested reader can’t discover more about you. Every author page should be filled out entirely when possible. How do you that? Visit Amazon Author Central to get started. 1. List all of your books. Click the Book tab and then Add More Books where you can search by title, author name or ISBN. Then check This is My Book. Add each one so they will be displayed under your profile page. In some cases the print or audio version may show up differently than the Kindle version depending on the publisher, so double-check that you have identified all of your books in every version. 2. Click the Profile tab and fill out a great biography. Add interesting details about you or awards your books have gathered, but don’t ramble. My advice is to keep it short and sweet. If possible write the essentials within roughly 300 words or less so readers won’t have to click the Read More button once it’s posted. It seems obvious that people would click the Read More button but you can’t rely on the obvious, and if an important detail (like your website) falls below the default area, some people will never see it. While HTML code is not supported, you can still copy and paste a URL for your website, a smart thing to do. The main author picture should be a close-up of your face with red-eye, cropping, etc. fixed beforehand with a photo touch-up program like Picasa. You can add up to 8 photos, which gives ample opportunity to share shots of you alone, with the family or pets, on vacation, having fun and more. Each picture tells a story so why not get 8 awesome photos in there? 4. Add your Twitter feed. Now your latest tweets will show prominently at the top. Might want to limit the chit-chat-with-friends variety of tweets if you do. 5. Add your Blog feed or RSS feed. This is normally as simple as copying your blog’s URL and adding either /feed (for WordPress blogs) or /atom.xml (for Blogger) as the suffix. You can also click the feed icon at your blog and then copy and paste the URL from your browser. Once that’s done, your Amazon Author page will display the titles and first lines from the three most recent blog posts with working hyperlinks. You can upload 8 different videos, each less than 10 minutes and under 500MB of data. Preferably these should be about your books or you as an author, in an interview, etc. 7. Create Author pages for other Amazon nations. Unfortunately this is not done automatically at present time, but you can manually do this for other Amazons, especially the one for the UK. I also do this for Germany, France and Japan because English is a very common second language. The good news is you don’t have to translate those sites because Amazon has the exact same format for each one. If you keep the US version open in a different window, it’s easy to follow the same routine for all of them even if you don’t speak German, French or Japanese. Keep an eye and ear open for future countries added to the list. For extra tutorials and links to the existing foreign Author Centrals, see this blog post and video explaining it step by step. Plenty of support information can be found by clicking the Author Central Help tab. Do you have other tips or ideas? Please share them in the comments section. This is so helpful — thanks! This task is at the top of my to-do list right now, and you’ve laid it all out all the steps so clearly. I particularly appreciate your tips about the bio section. This is always the hardest part: what to say, how much to say, etc. I’ll definitely be using this post as my blueprint! Fantastic, Carla. I’ll be checking with your progress of course. Just discovered your website. What a great resource to get started with indie writing. As far as foreign countries, Sweden might be one to consider; a high concentration of the Swedish population speaks English. Hi Shannon and thank you. What a great suggestion. Plus Sweden has such friendly people too. No wonder it’s mentioned among the happiest countries to live in. Thank you for sharing this. I will have to go back to my page and make sure I’ve done all I can. Great job.